As a professional investor, it may surprise some to hear that when it comes to investing, most of the time I lack clarity. Genuine, unequivocal, definitive clarity. Of course I’ve made enough mistakes and seen enough ‘good’ investors to know how to generate ideas, assess those ideas and then weight a portfolio. But most of the time I am dealing with ok ideas about ok companies that should do ok! Rarely do I come across that perfect union where a fat pitch, timing, circle of competence and (hence) confidence intersect. Looking back over the past 18 months or so, I can see 3 or perhaps 4 instances where the level of clarity was such that I could ‘see’ the outcome before investing: South 32, Pioneer Credit, Oil and (probably) Fairfax. On each occasion, the idea was identified early, had a major driver that effectively eliminated all of the calculable risk, was within our team’s area of expertise and hence generated a high level of confidence. Several weeks ago, that moment of ‘clarity’ arose with cobalt. Why exactly is hard to pinpoint, but it’s likely to have been a combination of several years reading and research intersecting with increasing media coverage and rapidly appreciating lithium stocks. Firstly, we need to recognise that 2017 will go down as the year that vehicle manufactures’ commitment to EV’s transitioned from niche to mainstream. In 2017, vehicle manufactures from BMW to Volvo drew a line in the sand and irreversibly committed to a new paradigm. Yes this will take time to play out, but this thematic will run for 30+ years. 30+ years. Rarely do we get a thematic of that magnitude. Secondly, of the main EV and battery ingredients – graphite, lithium, copper, nickel and cobalt – cobalt is the rarest in terms of commercially viable deposits. Of the 3 ‘new age’ minerals, graphite is in abundant existence and lithium whilst a little rarer is still widely distributed. In time we will hence see ample supplies of both graphite and lithium meet the market. But cobalt is somewhat different. At the current level of production there is just over 50 years of known reserves available. And with the rise of EV’s, the demand for cobalt will grow at strong rates. If we assume a particularly conservative growth rate of 10% per annum, that’s a doubling of demand approximately every 7 years. On that trajectory, the known reserves will be consumed in less than 19 years. If demand grows at 15% per annum, existing reserves will be consumed in just 15 years. 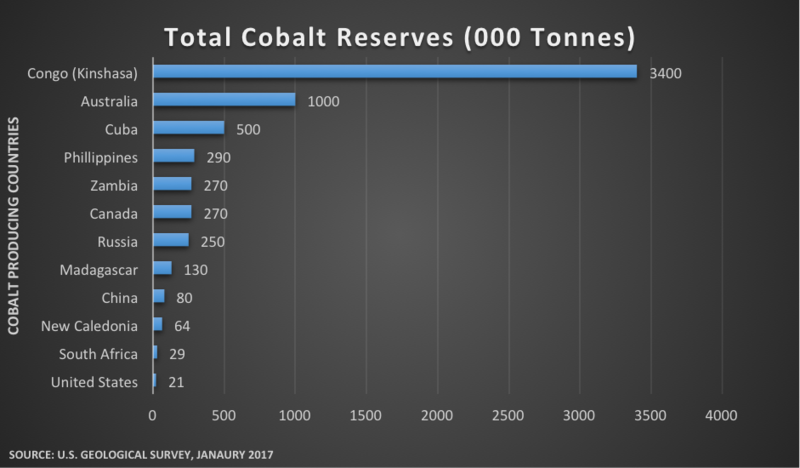 And there’s an additional 3rd point which makes the cobalt play even more compelling: currently 60-65% of all production is sourced from the Democratic Republic of the Congo (DRC). For China the issue is even more pronounced given that 93% of their supply is from the DRC. On the reserves front, the picture is similarly alarming, with the vast majority of known product residing in the DRC. Other reserves lie in similarly challenging jurisdictions such as Cuba, the Philippines, Zambia and Russia. Which leaves Australia particularly well placed as a 1st world, reliable source of new product. For Australian investors, that places the current opportunity firmly on our doorstep. In terms of which companies are best placed, we are working to attain the same level of clarity, but its fair to say we're not there yet! AML is towards the very top of our shortlist and we are meeting with the company today to progress our research. Keen to hear what investors like and why? Would be happy to get update after the meeting. Cheers. Cobalt Blue (COB) high grade tenement with a train line running straight through it! Morning. A great article, thank you. I have purchased a parcel in Cobalt 1 (CO1). Canadian based. Looks very promising. Beware projects with eye-catching high grades but no width or tonnage. Most of our work on Canadian/North American cobalt plays has left us particularly unimpressed at intersections measuring 1-2 metres or less. This is not gold mining! AML pregnant with newsflow over next 3 months. CLA also moving up our list. Hello Johan, Yes AML has certainly cemented its position as the #1 cobalt related play. Exceptional drilling results in terms of grades, widths and consistency. Thanks Romano. Look forward to your further articles on this thematic later in the year.